Welcome to lesson seven of your email course, Exercise Recommendations for Osteoporosis. This lesson is the final lecture in the course in which I cover core strength and osteoporosis. Although this is the last lecture in this email course you should consider it the start of our journey together. Today I’m going cover core strength and osteoporosis. It is ironic that I’ve left it for the last lesson, because with most of my clients, core strength is one of the first things I look at. The inner core initiates with our breath and then finally ends at our pelvic floor. When most people consider strong core they are thinking, “But I really want a strong core. I really want to have nice tight abs and I want to have, you know, a good solid center.” That is absolutely what I want for you. A stronger core that will have a great influence on your balance and reduce your risk of a fall and fracture. Imagine, which is what’s happening to a lot of people if they don’t have a strong core. They have all this movement that happens when they’re walking and stepping. But then they have their upper body weight and movement. There is nothing holding things together. So it slowly throws off your balance. A strong core integrates your balance and your ability to control your body movements. The other thing that a strong core does is that it really helps you have better posture — very important for people with osteoporosis. You know by now that a good posture and being able to hold your 11 pound head over your spine is very important to the safety of your spine. Another thing is that a strong core makes you feel so much better about yourself. That’s nice! Finally, a strong core allows the forces of your lower body and your upper body to be integrated. When you take up an exercise or activity you love to do, your core pulls everything together for you and allows you to just do it that much better. I know that all my clients that embark on a strength training program can lift harder and heavier when they have a stronger core. To help my clients build a stronger core safely (no sit ups or crunches! ), I wrote Strengthen Your Core. Let me introduce this book and the video series to you. 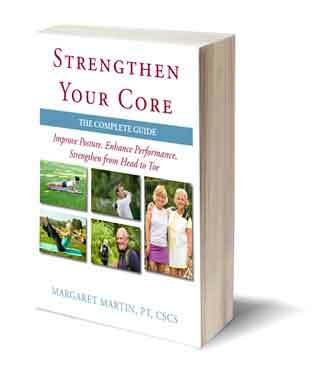 I wrote Strengthen Your Core for people like you who need to safely strengthen their core and reduce their fall risk. The book offers four progressive levels and is composed of planks and side-planks that will improve your core strength. No crunches or sit ups — exercises you should avoid if you have osteoporosis. I have a page dedicated to Strengthen Your Core as well as a detailed Core Strengthening Guide that is part of Strengthen Your Core. Strengthen Your Core is available in both print and Kindle formats. Congratulations for completing my seven day email course on Exercise Recommendations for Osteoporosis. We covered a lot of ground. I hope that you learned a lot on osteoporosis and exercise. How to stop the stoop from developing. Osteoporosis exercise guidelines to follow. The main components of an osteoporosis exercise program. The Exercise for Better Bones program and Stronger Bones, Stronger Body workout program. These topics cover the basics of an osteoporosis program. Hopefully you now know that an osteoporosis exercise program involves many facets and needs to be comprehensive. Thanks again for taking the course and feel free to share the course with friends and family you care about. Margaret, I discovered your book and feel both inspired and optimistic about having some control over osteoporosis. Watching your on-line class felt like you were in my own living room and we were getting together to talk about osteoporosis. I am so grateful for your passion to share your information so generously. I have a hyper sensitive CNS and so with any exercises I have to go slow and carefully to see how my body responds. This is a program that I can see develops step by step and has excellent explanations and pictures. I look forward to starting your program. THANK YOU!! Hi Marleen, Thank you very much for your feedback. It is very rewarding to know that individuals get benefit from the information I share. My husband always reminds me that I have the curse of knowledge. I try to imagine not knowing all I do and to teach in a way that helps people to feel empowered and in control. He is really the reason that this information is able to get out to reach you all. I share all compliments with him. It is good that you have come to recognize that your Central Nervous System (CNS) is hyper sensitive and that you have learned to move at a pace that works for you. Bravo. I appreciate the information in your book. That has caused me to make a chart and yesterday was day one in putting it to use. Am hoping it helps with my bone situation. On Nov1st, I sustained a painful debilitating lumbar compression fracture bent over foolishly trying to adjust a heavy leg press machine. On Jan 3rd, 2 more unexpected fractures occurred nearer to thoracic area simply rising from a sofa bed. I’ve had a Reclast injection, am on Calcitonin & am more attentive to Calcium in my mostly Vegetarian healthy diet. In addition to my Internist, I’m seeing a Rehab Ortho Doc & consulting an Endocrinologist. I’m normally an active gal in her late 70’s & am eager to get moving! My Rehab Doc has delayed PT – is concerned I could have more fractures. I’ve received 8 of your online lessons & am considering your Exercise Video for Osteoporosis. I still have some pain, tire easily, can now sit, walk & stand, but my body is crying for some exercise. Am I a candidate for carefully moving with your Video? Hello Janet, I am very sorry to read about your compression fractures. Our spine is not forgiving as to the reason we go into flexion. All flexion is loading on the front of the spine and thus onto itself places you at further risk of a compression fracture which you now are sadly to well aware. Not all compression fractures are the same. A stable compression should be fully healed and not pose limitations after 8 – 10 weeks. However, it is always advisable to follow the advise of your rehab Doc, he has his reasons, you may have an unstable fracture. Once he give you the green light, the Stronger Bones, Stronger Body video would be something you can build back up towards. It is not an easy program. It is meant to help build bone. In the meantime, the flexibility, balance and postural exercises in Exercise for Better Bones would be safe. I have just purchased your book “Exercise for better Bones”, and I’m excited about beginning. I downloaded the 6 day plan. I’m just wondering how to use it. I see that the appropriate exercises listed in the plan are in the book for Strength and Balance. But I don’t see where in the book the exercises are for Cardio/Weight Bearing, and Stretching are. Perhaps I’m reading it wrong. Could you set me straight on that? Thank you!